Cities & Knights adds quite a few twists to the original game. A great way to renew and refresh the original. If you enjoy settlers and you have played in so many times like me this is a great addition to it it adds the much needed gameplay for more advanced players. 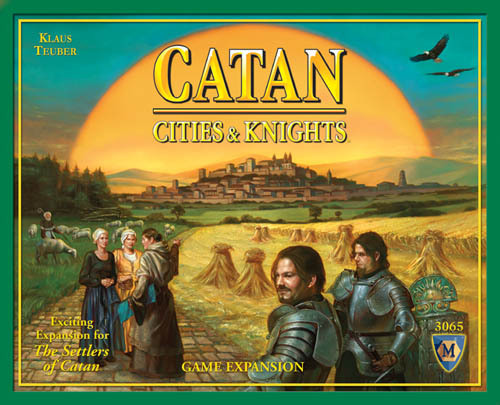 Cities and knights ups the ante on Settlers of Catan. While it adds to the playing time and complexity, once you have got used to it it's very difficult to go back to the base game. I have played this hundreds of times and will never say no to another game! When I say "Let's play Settlers," I always mean with the Cities and Knights expansion. It is usually the same when people ask me if they can play it. Cities and Knights was the perfect expansion to Settlers. It adds another layer of strategy (and I guess complexity) but it also gives a player so many more routes to take for points. I love the addition of commodities and how easy it is to get progress cards. These really help the game along. With so many ways to expand and get points, I sometimes have turns that I can get 4 points on. Great fun! If you're like me and have played the heck out of your Settlers base game, pick this up to instantly breathe new life into your game. The sheer amount of interaction and planning that you add makes this expansion worth it. If you're looking to make Settlers more interested, stop thinking and pick this up! If you only buy ONE expansion to Catan (which i found hard to do, as i own them all!) it simply must be Cities and Knights. I cannot play Catan without this expansion, it just makes a great game even better. With Cities and Knights the elements of war with barbarians, perks from having cities and commodities (the new "resources") and the tension of possibly losing cities perfects this already astounding game. Cities and Knights is absoloutly, hands-down, necessary with Catan. The best expansion for Settlers of Catan. Not something to jump into as a newbie, play Settlers about ten times before trying to tackle this one. Eventually, you will likely request only to play this version of Settlers, with occasional nostalgic games of the regular, before there were commodities. This expansion is the biggest change to the Catan game. It almost feels like a completely different game. It adds a much more in your face competitive style gameplay. You'll need to not only build your city, but also keep knights to fight off the invading barbarians, or your cities will be razed to the ground! A great expansion to the original, the knight really takes away from the bad luck of the robber, and the commodities really add to the game.